All About Low Volatility Investing helps you get started in low-volatility trading, a method that has been proven to outperform higher-risk, volatile growth stock investing over time. 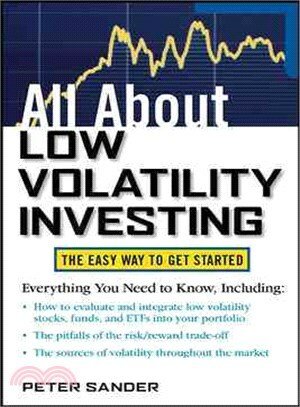 It shows what low-volatility investing is, how it works, specific ways to evaluate low-volatility investments, and strategies for building a low-volatility portfolio. Peter Sander is a professional author, researcher, and consultant in the fields of business and personal finance. He is the author of What Would Steve Jobs Do. PETER SANDER is a professional author, researcher, and consultant in the fields of business and personal finance. He has written 39 books including Value Investing for Dummies, The 100 Best Stocks You Can Buy, The 25 Habits of Highly Successful Investors, and What Would Steve Jobs Do, and numerous columns on personal finance andinvesting strategies. He lives in Granite Bay, CA.